As summer has well and truly set in in our city, it was but appropriate to have a workshop with the theme of summer. 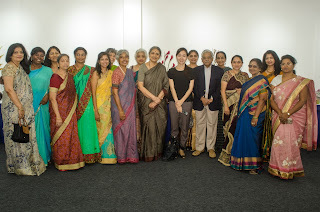 Ten members were present for the workshop. 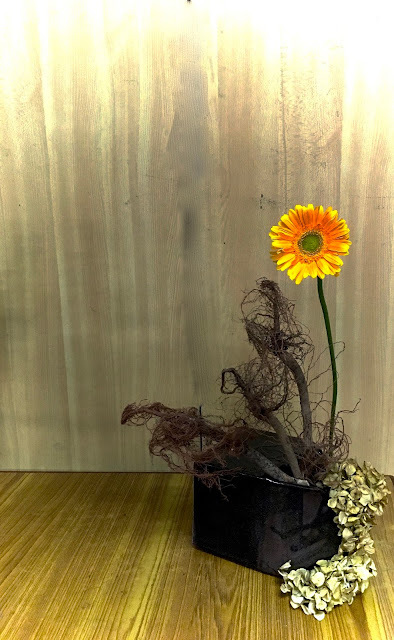 Sensei Dalley kicked off our meeting with a pleasing demonstration, with dramatic driftwood in each arrangement. Summer brought to mind the dry branches that await the rain. She began with a moribana, no-kenzan arrangement in a ceramic suiban. She spoke about looking to balance her driftwood pieces naturally without a fixture, that was her aim. 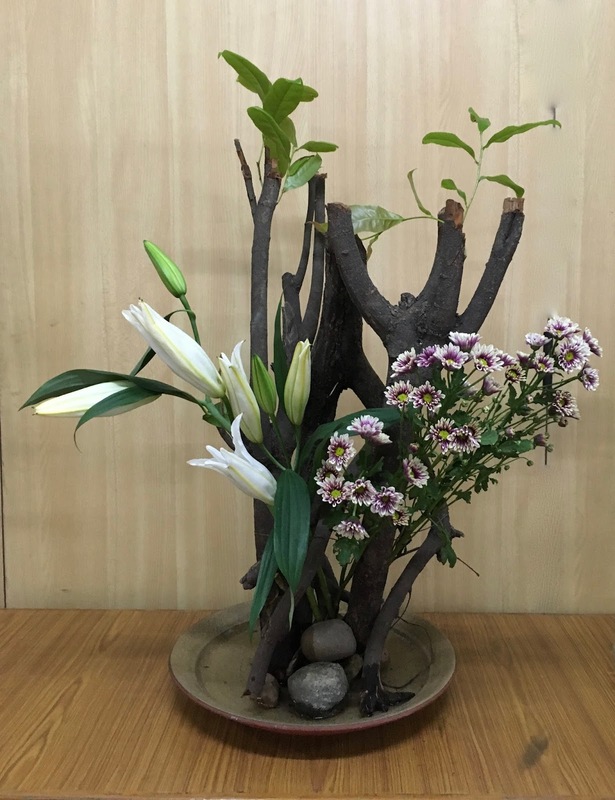 Sensei Dalley's first arrangement "Summer in the Woods", with the natural balance of the driftwood, the newly sprouting leaves and flowers. 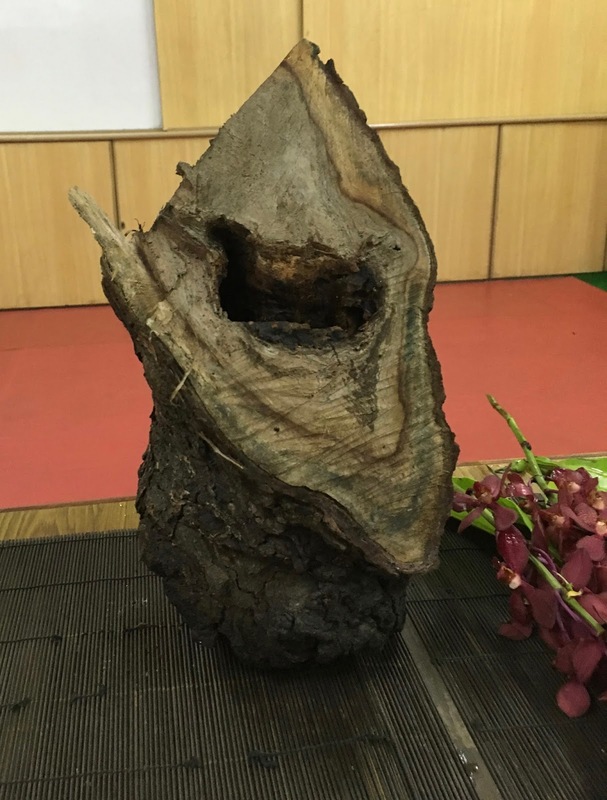 She had a most interesting anecdote about her second vase, which as you can see, is a burl, hollowed out tree trunk! 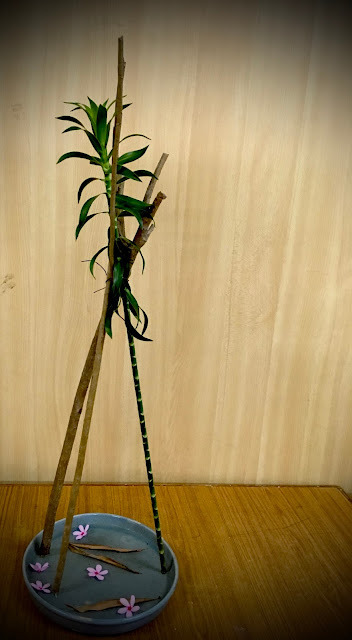 This neem tree branch had grown around the iron angle that adorned her compound wall, and in fact enveloped it. 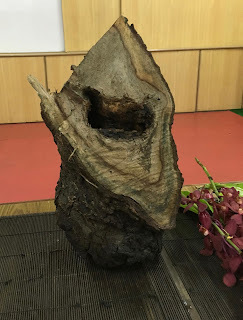 When cut, it revealed this lovely hollow! 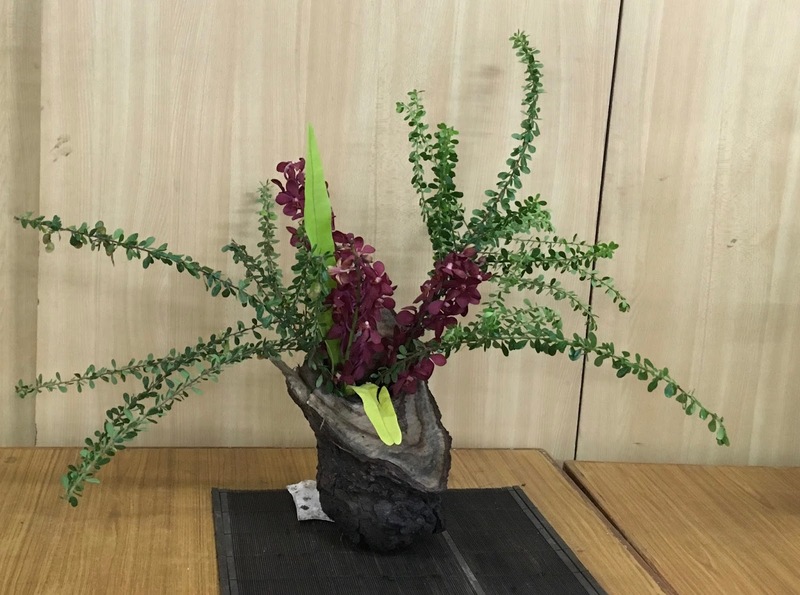 Using the burl as vase, the browns of the orchid complemented the vase, while in the circular motion of her branches mirrored the patterns on the wood. 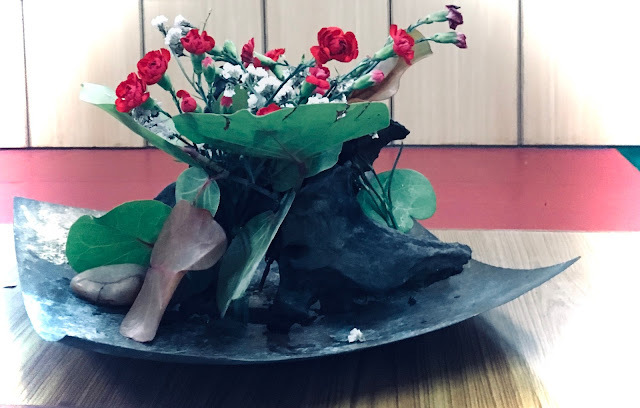 Using a copper plate that has oxidised with exposure to the air, sensei Dalley began her third composition with more driftwood. Using the leaves of Sea Grape, she nestled a few carnations and created the effect of shade under a large tree - something that is most welcome in the summer months. Sensei Dalley wished to end with an offerring of two Chabana compositions. These flowers from her garden were used to create the simple, natural look that is typical of the "thrown-in", nagiere style of chabana. 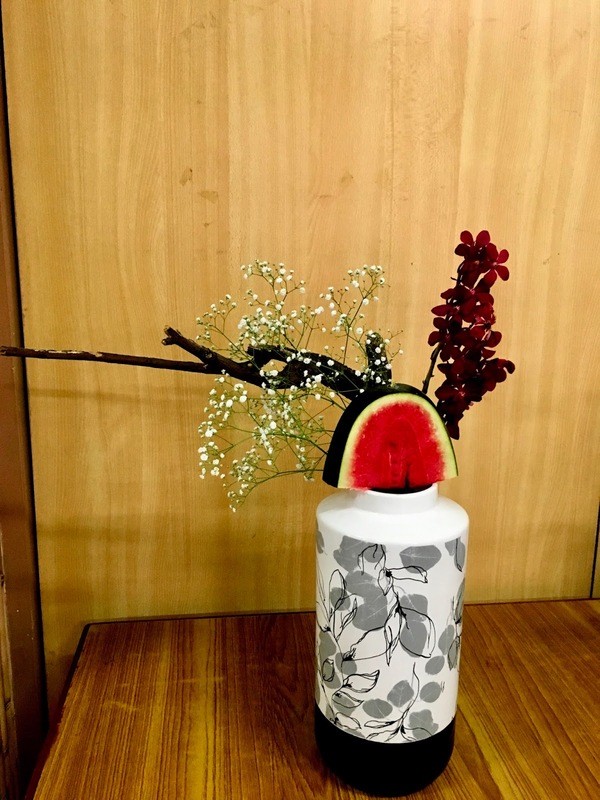 Sensei Dalley explained that flowers in chabana are usually seasonal and short-lived. After that delightful demonstration, it was time for the members to try their hands at summer compositions. 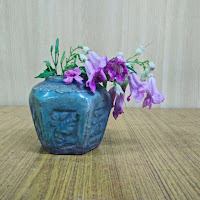 It was interesting to see the various associations that people had with summer. 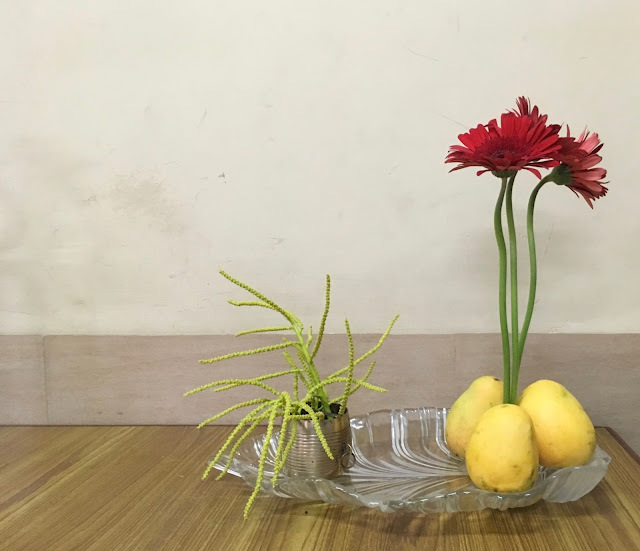 For Jyotsna, summer was the time for tall cool drinks maybe? "The sun shines, but we have a cool state of mind, " she says. 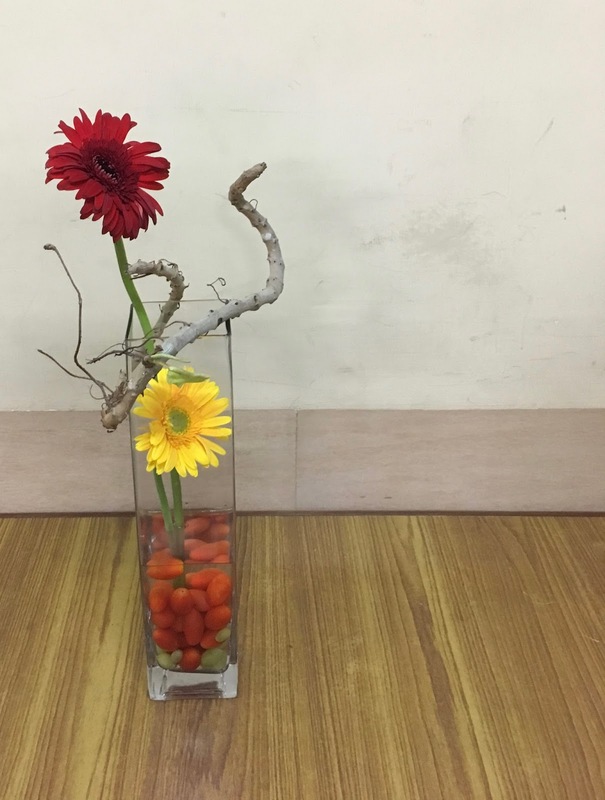 Cherry tomatoes in a transparent vase, with the bright colours of summer. 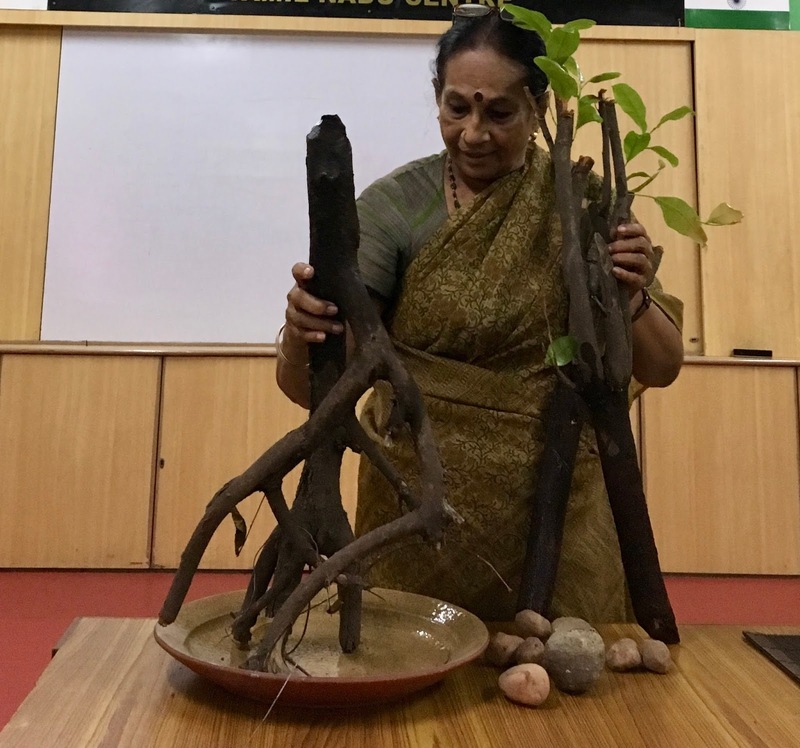 For sensei Malathi, summer is reflected in her dry garden, fallen flowers, and the tenuous hold of new life. 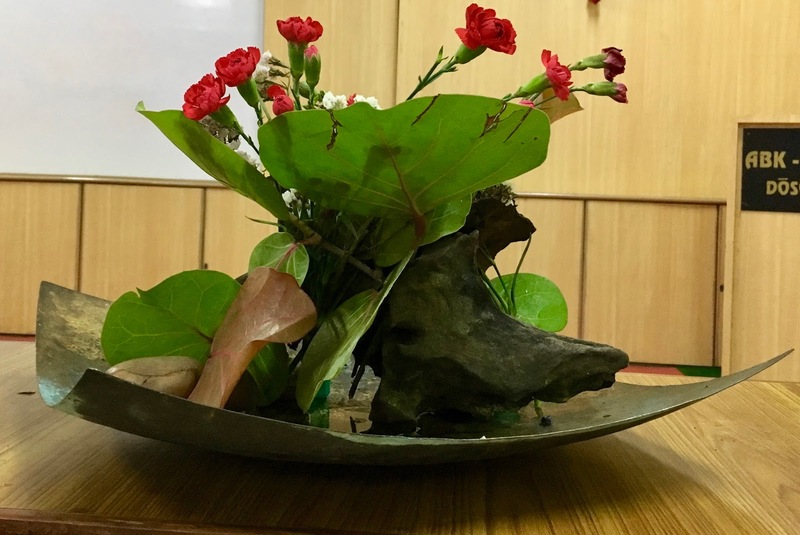 She says, "Dry hot winds made the dry leaves and flowers fall but those fallen on the water touched my heart." Bhuvana created this composition with mangoes, her best memory of summer! 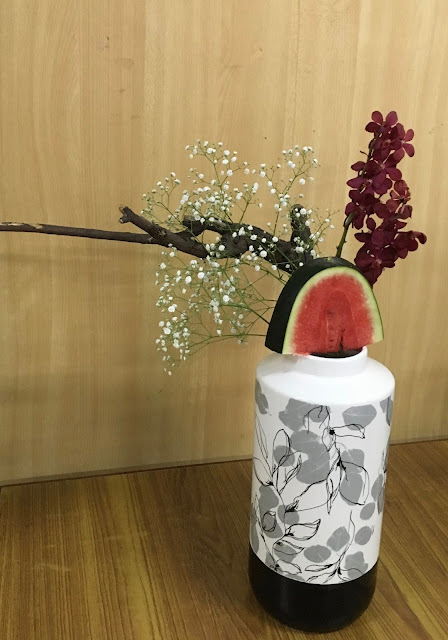 "Scorching heat, Cold watermelon", says sensei Prerana, as she combined the fruit in a white porcelain vase, with a dry branch and maroon orchids. For Sathya, the Copper Pod trees that line our streets are a strong summer scene. 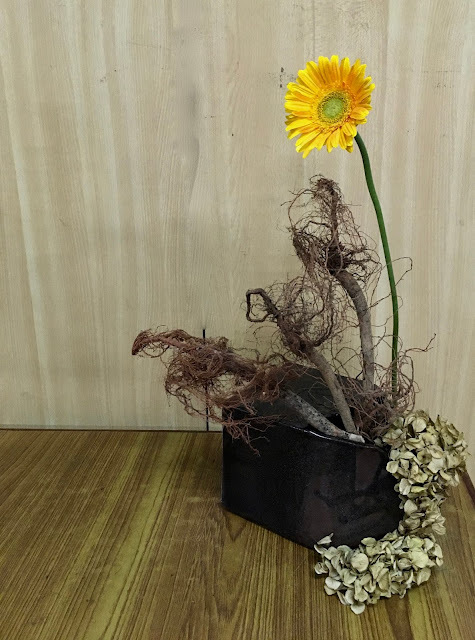 And finally, sensei Ambika showed a harsh summer, with the roots depicting the leafless trees, the dry dahlias symbolic of fallen leaves, and the bright sun that beats down on us. The session was followed by fellowship and laughter over lunch, as we bade goodbye to each other, until we meet again on the other side of summer! 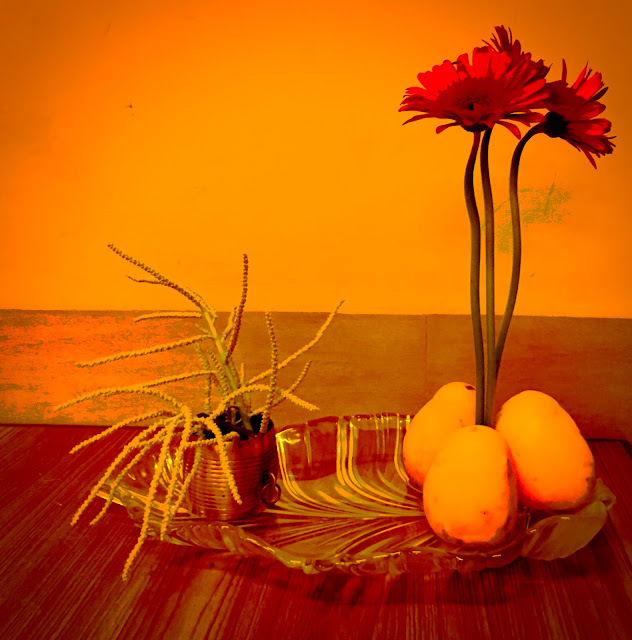 And here are some arrangements, with filters, just for some experimentation. Aim is to highlight the yellow, in a painting-like effect. 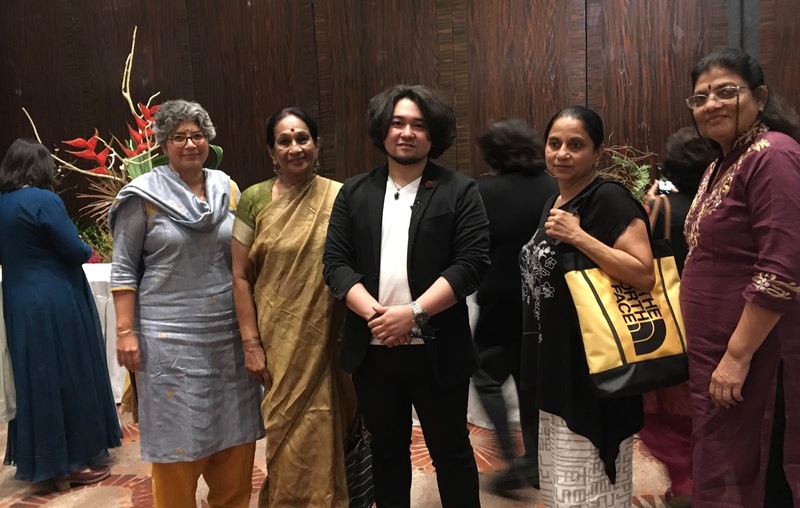 Four of our members had travelled to Delhi to witness the demonstration of Iemoto designate of Ichiyo school, Naohiro Kasuya. 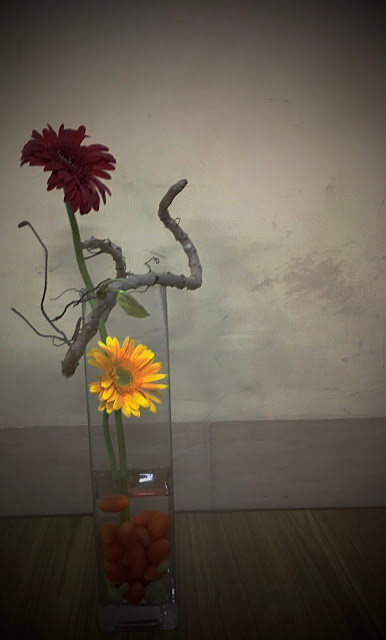 Watching and absorbing techniques and approaches of other schools of Ikebana is always a enriching experience. For our March meeting, the members hsared heir experiences, pictures and impressions of this demonstration with other members. The emphasis on natural balance and the Iemoto designate's artistic interpretations of his impressions of India were fascinating and enjoyable. This was followed by our election agenda. They will take over in June 2018, for the 2018 to 2020 period. 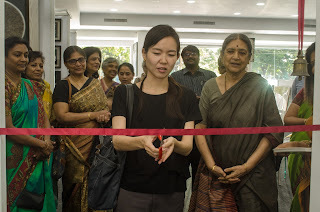 The Sogetsu Study Group Chennai had its annual exhiition at Focus Art Gallery in Egmore. 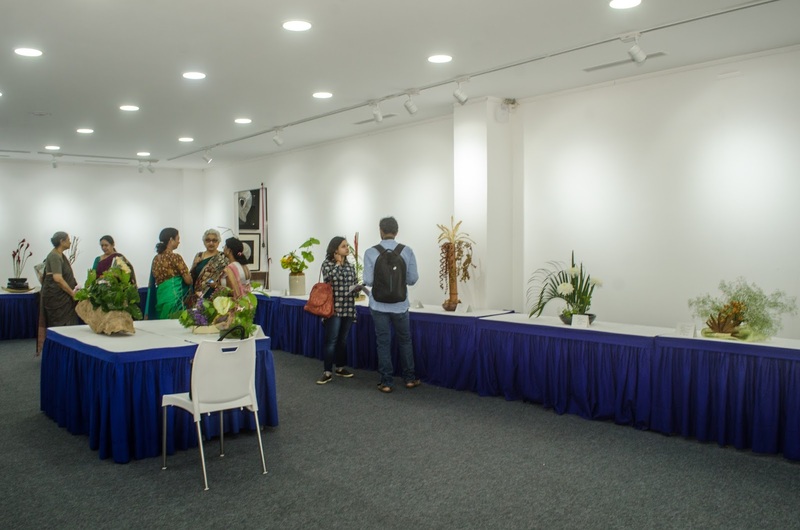 It was our first time exhibiting in this gallery, and members enjoyed the aesthetic ambience. Our exhibition pictures are here. Click on the link above to see the gallery of pictures, regarding the inaugurations, the visitors and the compositions. 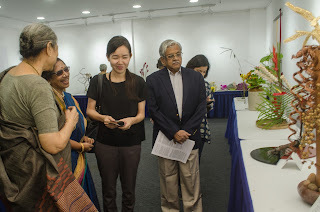 Short videos on the speeches by our chief guests are also in the album. It was a colourful and memorable affair!